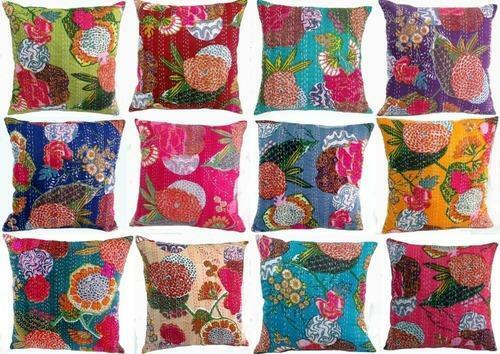 Manufacturer & Exporter of a wide range of products which include Kantha Cushion covers such as Indian Handmade Cotton Kantha Cushion Cover, Handmade Designer Cushion Covers, Printed Cotton Cushion Covers, Indian Printed Cotton Kantha Cushion Coves, Handmade Indian Printed Cushion Covers, Indian Handmade Cushion Cover and many more items. We are an eminent manufacturer, exporter, wholesaler and supplier of supreme quality Embroidered Cushion Covers. The offered embroidered cushion cover is high on quality & widely demanded in the market. During fabrication, we use only quality assured fabric and modernize machinery in order to maintain its predefined norms. Our quality specialist checks the complete range of embroidered cushion cover on a various provisions of quality so as to maintain its quality and longevity. *This pillow is lovely and practical,helps people keep relax and comfortable on a long journey or workplace or any other places and is a good gift for you. *The kind of decorative pillow design ideal is available to Sofa ,bedding. *Touch comfort and Soft. 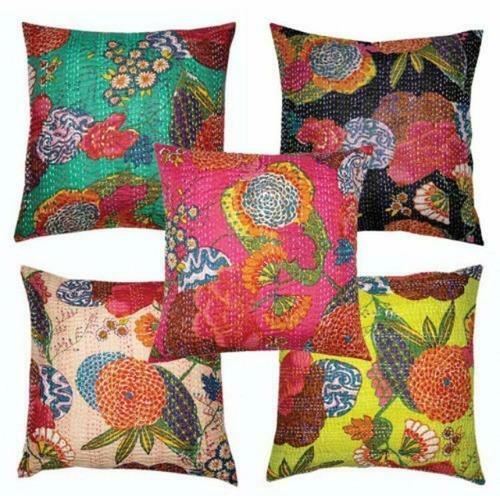 Looking for “Kantha Cushion Covers”?